NFsim is a free, open-source, biochemical reaction simulator designed to handle systems that have a large or even infinite number of possible molecular interactions or states. NFsim also has advanced and flexible options for simulating coarse-grained representations of complex nonlinear reaction mechanisms. A publication describing NFsim can be found here. 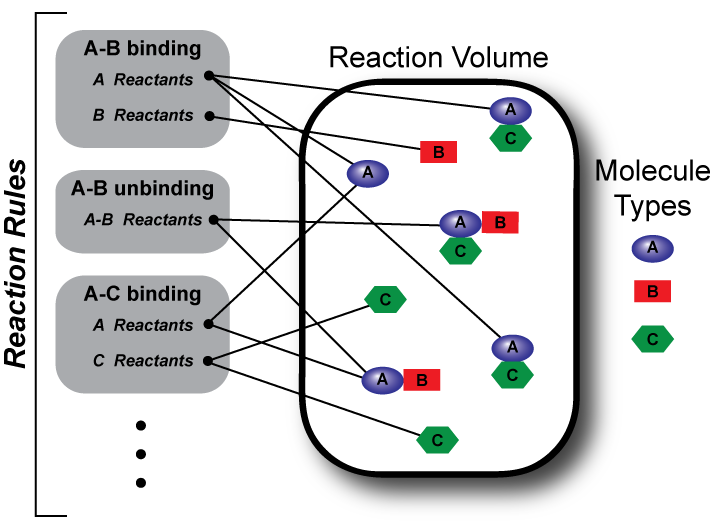 NFsim is ideal for modeling polymerization, aggregation, and cooperative reactions that cannot be handled with traditional stochastic or ODE simulators. Models are specified in the BioNetGen Langauge, providing a powerful model building environment. Note that you can now develop BioNetGen and NFsim models with a graphical interface in rulebender! NFsim runs on Windows, Mac, and Linux. To get NFsim now, go to the download page. To find out more about what NFsim can do, see the features page. To learn more about how to use NFsim, visit the support page. The NFsim framework was developed and is maintained by a collaboration between the Emonet lab at Yale University and the Faeder lab at the University of Pittsburgh, Support for NFsim comes from the National Science Foundation. Questions, concerns, and comments should be directed to Michael Sneddon mwsneddon@lbl.gov.